Dress up for outdoor running and treadmill running is not the same. So, before starting any treadmill running program, you should learn how to dress up for treadmill running. When a runner goes outside, he has to move through snow, winds or face the hot summer sunshine. But on the treadmill, you need not face such weather condition. For this reason, treadmill running requires a different dress up. Though most of the people enjoy the outdoor run, sometimes treadmill running is the best way for safety. However, you need some special gear to start running on the treadmill for a comfortable run. Why is it important to dress up on the treadmill running? Dress up on treadmill is essential. We see that when we prepare ourselves for any exercise, we do not feel comfortable with our as usual dresses. Every sport has some fixed dresses to wear. Like this, when you run on the treadmill in your home or a gym, you need to dress up such a way that you feel comfortable during your run. Your wearing can vary according to the summer or winter. But you need to dress up to start your run. For a comfortable and effective treadmill run, you need to dress up appropriately. Let’s see how to dress up for treadmill running. You can buy some tights for running on the treadmill. For warm indoor temperature, you can pack some breezy shorts. Do not try the snug-fitting tights. These are not comfortable when you cool down after a run. When you go to the market, you should choose the well-fitted, comfortable sweatpants. Comfortable clothing is important for running or other exercises. In the market, there are many types of the extra lightweight top for gym exercise. The air circulation of these tops is better. Even you feel very well when you activate the fan on your treadmill to enjoy some cool air. Lightweight tops will help you to cool down after the run. Besides, you will choose something that can absorb sweat properly. 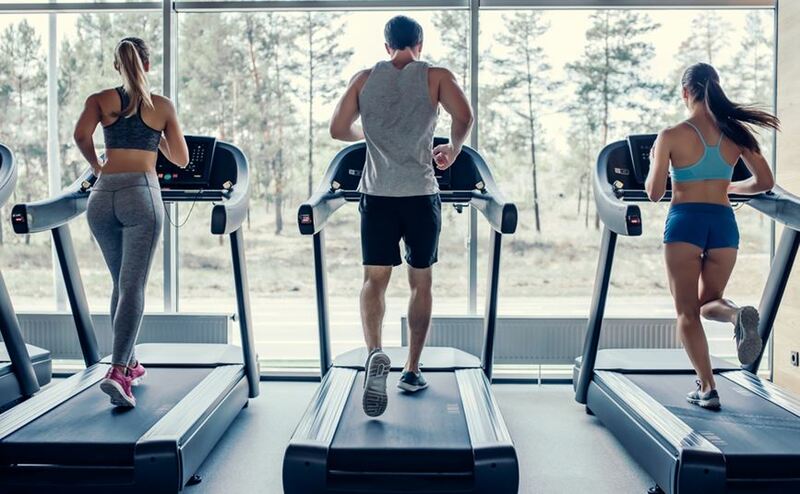 While running on the treadmill, your hair can fly and disturb your workout. There is a solution to this problem. To feel fresh during your running, you can try a headband. It will help you to get rid of this annoying feeling of flying hair.You will find the headband within the reasonable price in the shop. Some runners sweat more as like as a river during any run. For them, well-fitted shorts and tights are not comfortable. So, they can choose some cotton-made long-sleeve shirts during their workout on the treadmill. The loose shirts will provide a breezy feeling during all workout. You can think that running outside only needs a better pair of shoes which is well-fitted. But it is not true. When you run on your treadmill, you should wear a pair of running shoes that are comfortable and well-fitted. The wrong type of shoes can cause foot injuries or some leg pains. Grab a well-cushioned, well-fitted Running shoes to protect your feet from any type of injury. Besides, you should take the shoes of well-known brands and new stylish. Women need to wear a good supportive bra that is mainly designed for running and some other high-impact workouts. You can give a trial by jumping up or sometimes running before buying it. You should wear the bras that are properly fitted. If your chest is large and feels uncomfortable with some sports bras, you can try the top bras for sports with large chests. As most of the bras lost the elasticity after washing 72 times, you should change the bras in time. Do not wear the shocks that are made of 100% cotton. Cotton shocks cannot take the sweat properly, and you feel moisture inside your shoes. So, instead of cotton shocks, you can wear synthetic shocks that help you to prevent blisters. You can choose the materials such as acrylic, CoolMax, polyester, etc. During winter, you can wear woollen shocks. You can also find some double-layer socks on the market to prevent additional blister. Before starting a running program on a treadmill, you need to know how to dress up for treadmill running. It will help you to run with maximum comfort and avoid any type of running injuries on the treadmill. Wearing the right clothes also makes you confident to do everyday’s workout. So, keep yourself fresh and properly dressed before your run.